Our Featured Junior Rider of the month is Devin Fyfe! Although she has been involved with a lot, she says it has not been as much as she wants! She has done so many hay and shavings deliveries that she has lost count and she has been in the Musical Ride which she finds so much fun. Showing her Lancer spirit, Devin has helped out younger riders at shows and clinics and has also participated. Recently Devin took part in our Paul Halpern jumper clinic and had a fantastic weekend and had some great learning experiences at the recent Halloween Fun Show! Next year she hopes to help out with the beginner camps and Salmon River. Despite being at Lancers for only four years, Devin has had her favourites like Freddy and Pumba. Devin noted that Jacob has taught her a lot in past months and he is so great and bubbly. However, above all, Rockette is special to Devin. She explained “as soon as she came to the barn, I saw her beautiful face and I instantly fell in love. I’ve been riding her for a very long time and she has something to teach me every ride”. Rockette isn’t used very often in Devin’s lessons anymore because her injury means we don’t let her do any large jumps. But still, Devin notes that she “always has a special place in my heart and I have so much trust for her”. Like so many others, the favourite part of Lancers for Devin is the sense of community. She elaborated: “everyone is so welcoming and helpful; it’s really wonderful. When I was younger, I always looked up to the older kids because they were so nice and amazing riders. I think everyone has such a welcoming personality and that everyone has an influencing mindset at the barn which makes it so great! 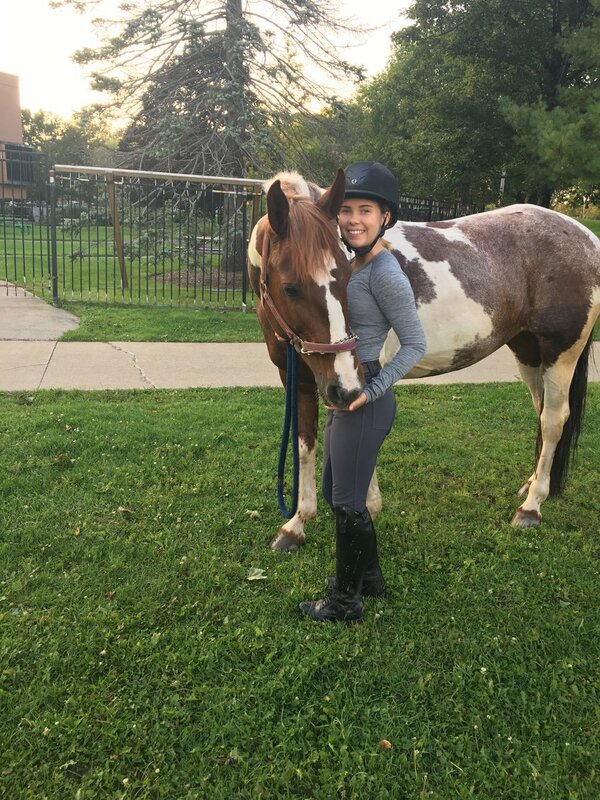 It’s so great how as soon as you walk into the barn you see so many people that you’ve become friends, and family with and it’s very heartwarming knowing that the barn is a place you can go to be instantly happy!” For Devin, riding has also brought many lessons in perseverance. Of her favourite memory, she explained that it shouldn’t be her favourite but it really is. It was her first time doing a line of jumps and she was on Freddy. He was getting old but never failed to teach kids some important lessons. When they came to the jump, Freddy refused and kept doing so. Devin used her crop and Freddy disliked this and took off bucking! Once he finished, the instructor just said “OK, good, do it again”. “I look back at that and laugh cause it was a lot of fun!, she added”. Devin is now in her senior year of high school so it’s her last year as a junior rider. She thinks she will have to make the very hard decision of leaving the barn for a little while she’s in university but she really hopes she can come back to the barn to ride again. She would really like to go to Acadia University to do Kinesiology for two years and nursing at Dal for the last two years (and then she’ll be able to return to Lancers). 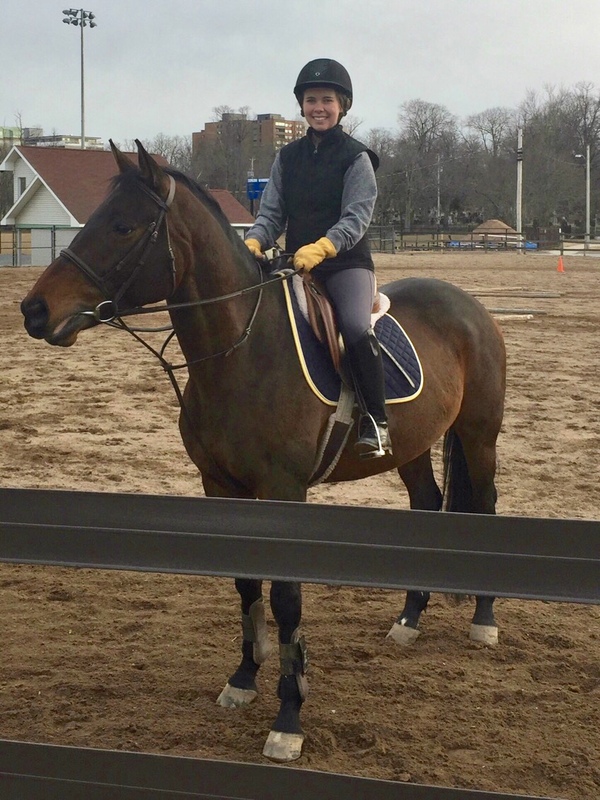 While Devin sets her sights on the future, she is still currently balancing riding with her other sport, rugby. The season starts around February and ends in May and last year it was really hard for her to attend riding and that made her so sad she can’t even explain. With her typical display of determination, this year she is going to try and manage it with lots and lots of makeup rides! Thanks, Devin, for showing us all what we can do when we really set our minds to something. Our Featured Volunteers of the Month are Erin Gorman Corsten and Gerard Corsten! Our Featured Horse of the Month is Bobbi!